Here’s another new feature for you: The little things! In this column I will write about all the clever little things I have found on the internet or have been told about, that make your life easier and help you help. You can make a change without even noticing. Some things are also inspiring stories, that just made me smile, hopefully you, too. The first one is a really great plug-in for your web browser (I think at the moment it works with Google Chrome and Safari, but Firefox is coming soon as well) called aVOID. I read about it in the newspaper the other day and immediately had to try it (Sidenote: Is it just me since I am more conscious now when it comes to information about whole-some living or is there more and more coverage of these topics in the media every day?). 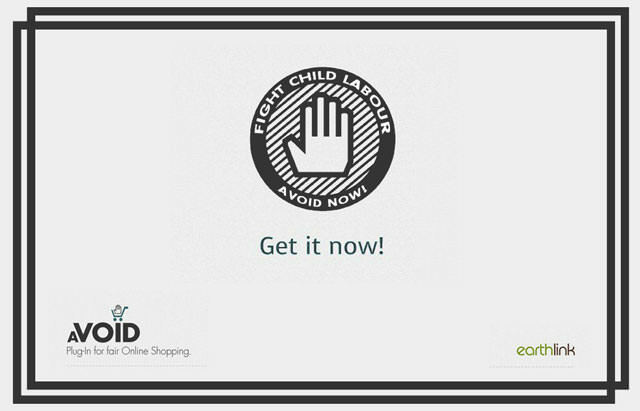 Anyway, aVOID is a tool that helps you avoid buying products that are in any way associated with child labour. As it is stated on their site, there are more than 73 million children working under inhuman conditions, mostly just to produce our clothing. So now, if you have installed aVOID and visit a site like Amazon or Asos (and some other shops like Zalando, Target or Macys) they will show you a white blank page instead of the brands that are using children in that way. Of course, I immediately had to test it and it actually works! So, if you are only browsing you won’t really notice the big difference because the bad products are just not shown (and let’s be honest, there are way too many options to buy at Asos anyway, so there’s a pretty big selection left). If you are looking for a specific brand (for example American Apparel), there will just be a little hand instead of the product photos. Pretty effective and pretty cool, right? For more information and to download the plug-in, you can go here (by the way, it’s free! ).